The following are questions often asked by individuals researching animal massage. If you have additional questions about our program at ITT, please contact us at wshaw1@bright.net and we’ll answer you by return email. A general relaxation and sense of well being. Bonding between the animal and owner can be enhanced. Massage can educate the animal to the value of good touch/safe touch. Massage provides a hands-on check for muscle imbalances and changes on the body. It increases blood and lymph flow. Massage removes metabolic waste products from exertion or injury. Massage reduces muscle tension allowing for greater flexibility. It promotes exchange of intercellular fluids at the cellular level. And it provides timely insights for the need for veterinary care. 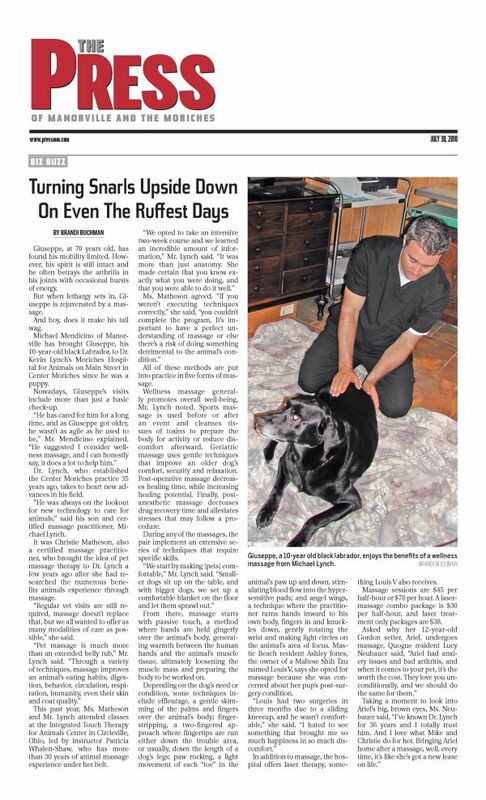 Click here to see an article on pet massage. 2. Do I have to have a license to perform animal massage? Each state is regulated separately. To find out what your state's laws are, contact your state Attorney General’s Office and ask about the laws governing animal sports massage. 3. Do I have to have any experience or have to be a licensed massage therapist to attend classes at ITT, Inc.? No, the only pre-requisite to attend our workshops is the willingness to learn and to be comfortable around the animals. 4. Should students take the Level 1 & 2 courses consecutively or is it best to take one level at a time? The ideal way to take the workshops is to take Level 1, then go home and practice doing 25 – 50 massages. When you return you will have more hands-on experience and many questions to ask in Level 2. We do, however, offer them consecutively for those who cannot do this due to time contraints. 5. Do I receive a certificate after completing the class? 6. Can I visit the farm and teaching facility? Yes, please do. We do ask that you call the office at 1-800-251-0007 and a leave a message with contact info and your phone number or email us wshaw1@bright.net to set up a tour. 7. Do I have to travel to Ohio or do you have correspondence courses? At the present time, we do not offer correspondence courses. Our workshops are hands-on only. You must travel to Ohio to attend the workshop or you may arrange to hold a workshop in your area. You can call our office at 1-800-251-0007 to get further information on how to set up a workshop in your area. 8. Do you offer a discount of any kind? We offer a discount of 5% to students. We offer a 2% discount if you pay by cash, check or MO. If you are in a massage or animal healthcare program, have your school send us a confirmation of your student status and we will deduct 5% of your class fees. All discounts are applied to your final balance due. Your confirmation of registration in a class or classes will have your adjusted tuition information at the bottom of the page. 9. How do you find out what the animal sports massage laws are in your state? You can contact your Attorney General’s office and ask them what the state regulations are for animal sports massage. 10. After taking the class, will you be able to do the massage with confidence and start your own business? After completing the workshop, you will be able to perform a relaxation and sports massage application. As you practice on different animals, you will gain more confidence in this bodywork. You will also receive information on starting your business, advertising, business ethics and safety during class. 11. How many students are in each class? No more than 8 students per instructor. 12. Why choose Integrated Touch Therapy, Inc., over other schools teaching this type of bodywork? Patricia Whalen-Shaw, MS, LMT, BTCMB, APP, and RCST® has been teaching canine, feline and equine massage here at her farm since 1992. She is a pioneer in this area of bodywork, training thousands of students about massage technique for animals and how to apply these techniques while honoring the animal. At ITT, Inc., we teach intensive, hands-on classes. 13. Will I be working on live animals? Can I bring my own? Yes, you will be working on live animals. We encourage students to bring their pets but if this is not possible, we have dogs, cats and horses here at the farm that volunteer their services. 14. Do you help with job placement after completing the class? We do not help with job placement directly; however when someone calls from your area needing an animal massage practitioner, we give them your contact information if you have given us permission to do so. 15. What are the guest lecture workshops, and who may attend? We host workshops on related animal bodywork, different types of healing systems, skills related to observation of movement, communication, etc. Some instructors have prerequisites and other workshops do not. The information about each workshop is available on our guest-lecture series page. 16. Where do I stay when I come to the workshops? When you register for a workshop, we will send you a packet with an accommodation list of motels and bed & breakfasts in our area. There are pet-friendly accommodations and there is camping contact information as well as information for those who cannot bring their animals along. Horses can board here. Contact our office at 1-800-251-0007 to leave a message, or email us: wshaw1@bright.net.